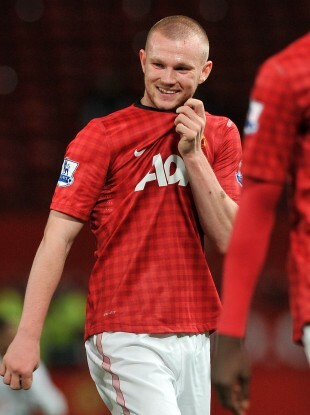 Ryan Tunnicliffe smiles as he leaves the Old Trafford pitch. With those words, boomed across Old Trafford on Wednesday night, Mick Tunnicliffe was £10,000 the richer. 19-year-old Manchester United midfielder Tunnicliffe made his competitive debut in Manchester United’s 2-1 Capital One Cup victory over Newcastle United and his father, Mick, is set to collect a 100-1. In 2002, with his young son a talented nine-year-old, Mick went along to William Hill bookmakers and bet that his son would, one day, play for United. 76 minutes into the cup tie and a father’s pride was transformed into fat stacks of cash as the midfielder replaced the Belgian, Vermijl. Tunnicliffe Sr has placed another bet of £100 that could land him more money in the coming years. His bet, placed with odds of 350/1, is for Ryan to make his international debut with England. The last time a bet of this nature cost us £10,000 was when Chris Kirkland made his debut in goal for England, also landing a £100 bet for his father. Tunnicliffe spent last season in the English Championship with Peterbrough United, which is managed by Darren Ferguson, son of Manchester United boss, Alex. Email “Family Fortunes: Father of United debutant snaps up £10,000 bet”. Feedback on “Family Fortunes: Father of United debutant snaps up £10,000 bet”.